With their refreshing, sharp flavour, Seville oranges make great marmalade. Also, unlike sweet oranges, their pith becomes transparent and glistening when cooked with sugar, resulting in a bright, sparkling preserve. Make sure you use a suitable preserving sugar. The season for Seville oranges is short, usually lasting only a few weeks in January. So it is worth making a batch of marmalade now to enjoy the flavour throughout the year. Cut the peel as thickly or thinly as you prefer, according to taste. This task should not be rushed and is one of the pleasures of making marmalade. Wash the oranges and lemon thoroughly, then dry them in a clean tea towel. Pour 2 litres cold water into a large, wide pan or preserving pan. Squeeze the oranges and lemon and add the juice to the water. Reserve the pips and orange rind, but discard the squeezed lemon. Cut the orange peel into strips - chunky for coarse cut and thinner for a fine shred. It is easier and quicker if you place 2 pieces on top of each other and slice with a sharp knife. Add to the pan and bring to the boil, then reduce the heat and simmer, uncovered, for 2 hours, until the peel is very soft and the liquid reduced by about half. Remove and discard the bag with the pips and pith, squeezing as much juice as possible back into the pan with the back of a wooden spoon. Use a large, wide pan to make marmalade. The mixture should not come any higher than half way up the sides. A wide pan helps the liquid to evaporate more quickly and reduces the likelihood of the marmalade boiling over. At the end of paragraph 3 of the instructions, prepare the jars. Preheat the oven to 160°C, gas mark 3. Ensure the jars are clean and free from cracks and chips. Place the jars on their sides in the oven for 10 minutes, then turn the oven off leaving the jars inside until the marmalade is ready to pot. Preserving sugar has larger crystals which dissolve slowly. This minimises scum and results in a bright, clear marmalade. Much of the pectin which makes marmalade set is found in the pips and pith. This is why it is wrapped in a muslin bag and boiled with the marmalade so that as much pectin as possible is extracted to ensure a good set. For a touch of spice, add 3 tbsp grated, fresh root ginger at the beginning of the cooking. 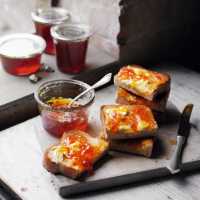 To make a darker, rich marmalade replace 100g of the sugar with dark muscovado sugar. Make your marmalade extra special by stirring in 75ml whisky just before potting. Store in a cool, dry place, away from direct light which will fade the colour. The marmalade will keep for up to one year. This recipe was first published in Wed Jan 01 00:00:00 GMT 2003.